day in the most elegant of ways. 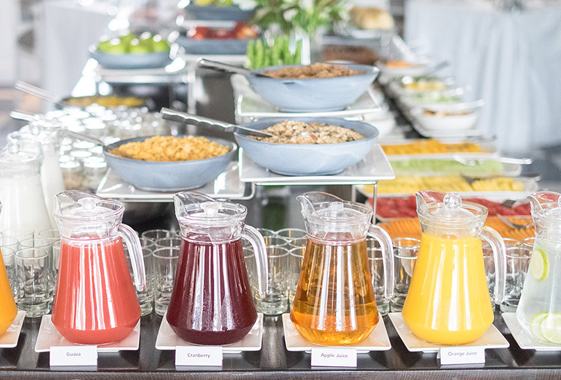 The breakfast buffet is set up each morning inside the Pavilion’s main dining section; guests can sit inside or take their pick from two al fresco options, either in our courtyard by the pool, or on the outside pavilion overlooking Walker Bay. A mouthwatering spread of fresh fruit and freshly baked pastries are laid out each morning, together with cereals, a selection of local cheeses and cold cuts, and delicious Franschhoek Smoked Salmon Trout; while hot breakfast options are served à la carte. Our indulgent Walker Bay Breakfast Specialties include Spanish Omelette with haddock, cherry tomato, cream cheese, capers, onions and rocket; Waffle with berry compote, vanilla ice-cream and maple syrup; and French Toast with crisp bacon bits, maple syrup, cinnamon sugar and toasted pecan nuts. Apart from serving as the breakfast room, The Pavilion can also be booked for exclusive lunch and dinner functions.